I know I say this a lot, but this recipe is a new favorite. 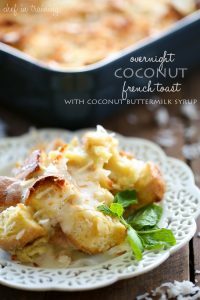 Everyone who tried this Overnight Coconut French Toast Casserole declared the same thing… its just plain and simple the best! Lets just talk about this Coconut Buttermilk Syrup… It is adapted from the Amazing Buttermilk Syrup recipe on my blog- and it. is. the. BEST. It’s one of those things you just have to try for yourself and see. You will want to have it on everything. This is the perfect recipe for wowing company with very little effort on your part. Work is done the night before and all you need to worry about the morning of, is to preheat your oven and pop it in. Thats it. Oh. and make the syrup too. But that comes together in like a matter of minutes. Try out this recipe. You will not be disappointed. This could very well be the BEST breakfast casserole you ever eat! The coconut flavor is AMAZING! In a large bowl, beat eggs, coco lopez and milk together until well mixed. Pour egg mixture over bread cubes and press bread cubes down with hand to coat all of them. Cover with baking dish with saran wrap and place in fridge over night. In the morning when ready to bake, preheat oven to 350 degrees F.
Sprinkle coconut over the top of casserole. Bake uncovered for 30-35 minutes until done. Serve with Coconut Buttermilk Syrup. Combine butter, sugar and buttermilk in a medium saucepan over medium heat until sugar completely dissolves. Then remove from heat and add baking soda and coconut extract. Stir to combine. Syrup will foam up, but that is part of what makes it SO incredible. Don't be alarmed by that. Drizzle (or if you are like my family then saturate) your french toast with syrup and enjoy! I love overnight breakfast casseroles. This sounds delicious - especially the coconut buttermilk syrup! YUM! Can't wait to try this! This sounds so delish but one question. The ingredient list says 1 cup coconut. But in the directions you didn't tell what to do with it. So sorry about that, you sprinkle it on top in the morning before baking. I fixed it now in the instructions. Thanks for catching that! When does the 1 cup coconut get added? Do you sprinkle when done. I have read and don't see it in instructions. This looks delicious. And so easy to do. I can't wait to try this. Thanks for the recipe. Just a quick question, do you use the sweetened flaked coconut, unsweetened flaked coconut, or fresh grated coconut? Is it coconut cream or coconut milk? Thank you! I made this for the family and believe me when I say, it was their new favorite french toast! We did not have leftovers! Sounds wonderful! However, I've never heard of Coco Lopez. What is it and where can I get it? coco Lopez is a brand. Which type is this? Milk or Creme I suspect but it doesn't say which one. What is coco lopez and where do I buy it? We made this recipe for Christmas morning and it was incredible. We had to tweak it a little bit because we have numerous allergies in our family. Making it mostly vegan except for the eggs and Gluten free. This is definitely going to be our new Christmas morning French toast. I did post the changes on my blog with reference to your recipe. Thank you so much for sharing. This was part of our Christmas brunch. It is awesome. This looks amazing!!! Do you think this would be just as good with soy milk (or carton coconut milk) in place of the regular milk? Or do you think it's best to stick with normal milk for this?